DENVER – It’s always better to win ugly than lose pretty. 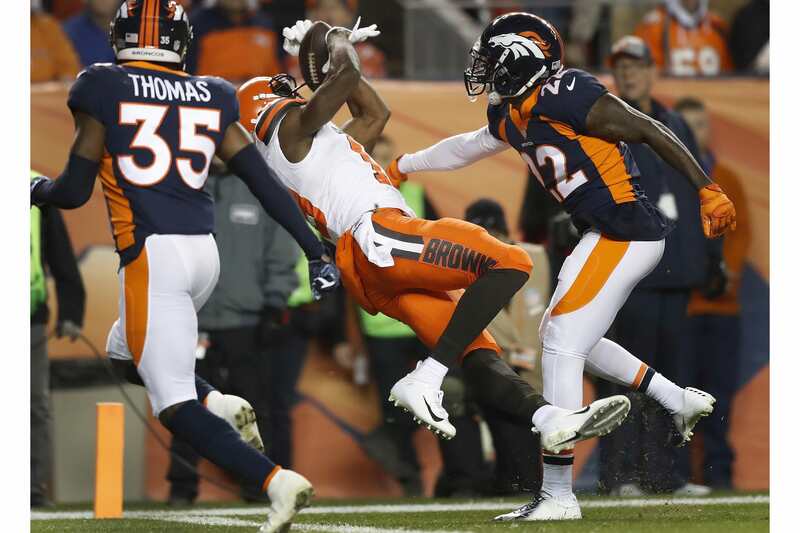 That’s exactly what the Cleveland Browns did on Saturday night in Denver, edging out the Broncos in a sloppy 17-16 win. It was their first against the Broncos since 1990 (before I was born for what it’s worth). Cleveland took an early lead on their first possession of the game, as Baker Mayfield capped off a four-play drive with a touchdown pass to Brashad Perriman to go up 7-0. Encouraging as the hot start was, it didn’t last, as the Browns punted on three of their five remaining drives of the first half, including two three-and-outs and squandered a potential scoring drive just before the break due to a Baker Mayfield interception. The second half began with a 15-play, 43-yard drive that took more than nine minutes off the clock but ended without points for Cleveland. Meanwhile, Mayfield was hardly himself throughout most of the evening, completing just 18 passes for 188 yards. A second touchdown pass in the second half however gave the Browns a lead they’d never squander. There’s a reason Baker Mayfield is very much in the conversation for rookie of the year, if not leading the race. Entering Saturday night the No. 1 overall pick had thrown for 200 or more yards in five straight games to go along with 11 touchdowns and just four picks. In three of those games, Mayfield threw for over 250 yards and nearly had his first 400-yard passing performance in Week 13 against Houston. 11 starts into his career and Mayfield is already making a name for himself as a productive quarterback, which obviously has Browns fans excited. Even the best QBs are susceptible to a bad night though and that was the case last night in Denver. 18-of-31 passing for 188 yards is hardly the type of outing anyone is used to with Mayfield. His 58 completion percentage was tied for the second worst of his rookie season. Jabrill Peppers has been subjected to plenty of criticism over the course of his first two seasons in Cleveland. His struggles at the safety position and on special teams are well documented. However, in spurts this year he’s made some tremendous plays. Chalk up his performance in Denver as arguably the best of his young career. As part of a six tackle effort, Peppers had two sacks and snagged an impressive interception in the first half. Putting it that way isn’t doing justice to the 2017 first-round pick though. The timing of his plays were important. For example, the interception (below) came with 1:42 remaining in the first half with the Broncos just outside of the red zone looking to score and potentially take a lead into the break. Peppers wiped out any hope of that and kept the game tied at 10. That’s a huge momentum swing. Jabrill Peppers with the INT in the end zone! And then there was the second of his two sacks, which sealed the win for Cleveland. Safe to say Browns fans appreciated Peppers after this one. Not a lot of words for that one. Mayfield deserves plenty of props himself for the throw, but that’s a tough catch. It was Perriman’s first touchdown since November 11, 2016, which ironically came against the Browns. John Dorsey took a chance on Perriman and it’s paying off. He’ll be a free agent at the end of the season, but Cleveland would be wise to hold onto him, especially considering Mayfield has all the confidence in the world in the third-year wideout. Gregg Williams is known for being bold and his decision to go for it on fourth-and-one from Denver’s 13 with a one-point lead and under two minutes to play falls in the “bold” category. Unfortunately Nick Chubb was absolutely stuffed on the play and Cleveland gave the ball back to Denver needing only a field goal to win the game. On one hand, you want to have confidence in your guys to pick up the one yard that stands between you and a sure victory. Williams also understood that if they didn’t pick up the first down Denver would be backed up deep in their own territory for the start of their next drive. Still, kicking the field goal there is the smarter choice. Fortunately, Williams’ defense did it’s job and stopped Denver shy of field goal range to seal the deal. In many ways the decision was a microcosm of Williams situation. There’s a lot of chatter that Dorsey won’t keep Williams on as head coach beyond Week 17 and will hire his own guy. If so, Williams has nothing to lose with a team that’s playoff hopes hinge on winning out. So keep being bold Gregg Williams. Crazy as it sounds the playoffs are still a possibility for the Cleveland Browns and there is a very good chance that through at least next week they’ll be playing meaningful football. By beating Denver last night, the Broncos are officially eliminated from playoff contention, so that’s one less team to worry about. Obviously winning out is a must for the Browns and then they’ll needs to help. But as the Sunday schedule gets underway today the Browns can still mathematically win the AFC North or clinch the second wild card spot. The other teams in the way are the Steelers and Ravens for the division and the Titans, Colts, Dolphins and Ravens for the wild card. The only scenario in which Cleveland wouldn’t be playing another meaningful game next week is if the Steelers beat New England and both the Colts and Titans win this weekend. That’s because the Browns need Pittsburgh to lose out to have a shot at the division and need Indianapolis and Tennessee to each lose two of their last three games to have a shot at the wild card. Because those two division foes play each other in Week 17 a win from both guarantees that one of them can’t possibly lose two games. So Browns fans, you have some more cheering to do today.